Why I don't consider cheese as a healthy snack for my kid? One of the questions I'm often asked by mothers of young kids is "Why do you consider cheese as unhealthy? It is rich in protein and calcium. Growing kids need cheese every day." Cheese cubes have become a must-feature item in a young kid’s mid-morning snack box these days. If you were born in the 70s or 80s, you wouldn’t even have heard of the term “cheese" while growing up. Kids were given milk, ghee and buttermilk and these were the ONLY dairy products that were available back then. When I was a kid, I vividly remember eating “buttermilk rice” (more saadham) and definitely not “thick curd rice” (thayir saadham) that we eat these days. Didn’t we all grow up fine? Didn’t we get enough protein and calcium? Why is this insane obsession with cheese, I wonder. My daughter loves cheese and I use Mozzarella cheese occasionally whenever I make pizza or pasta at home. Sometimes, she would insist on buying a pack of cheese slices when we go to the supermarket. On days I oblige to her wish, I would pick the pack of 5 slices (minimum quantity) and ensure she doesn’t eat more than 1 slice a day. There are two main reasons that prevent me from placing cheese on a high pedestal. As I wrote in my earlier blog post on Brittania cheese slices, each slice contains a whopping 285 mg of sodium. 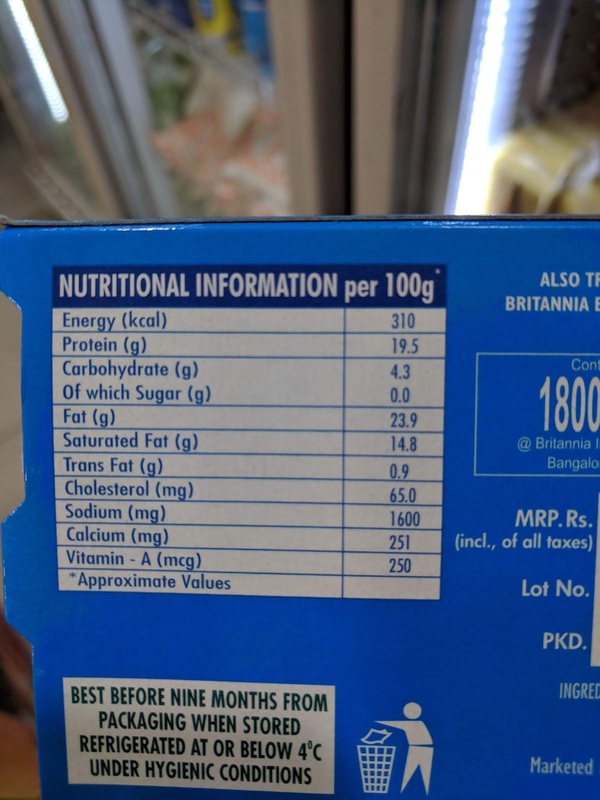 Similarly, each Britannia cheese cube of 20 gm serving size contains 320 mg of sodium. As I mentioned in my earlier posts, the adequate intake (AI) of sodium for kids in the age bracket of 4-8 years is 300 - 600 mg/day. If we take the average (450 mg/day), then 1 cheese cube is enough to reach 71% of their AI. So that’s exactly the reason why kids get addicted to cheese - TOO MUCH SALT. If the same child eats a tbsp of ketchup or mayonnaise that day, then he/she would have easily exceeded their daily limit. How would a child’s kidneys be able to handle such high amounts of salt? We are a little more aware of the ill-effects of high sugar because of immediate/short-term reactions - increased cases of dental cavities, hyper-excitement and sugar rush. But in the case of salt, the effects are not immediate but impacts their health in the long run. High salt intake in children influences blood pressure and may predispose an individual to the development of a number of diseases including: high blood pressure, osteoporosis, respiratory illnesses such as asthma, stomach cancer and obesity. “The longer the shelf life. 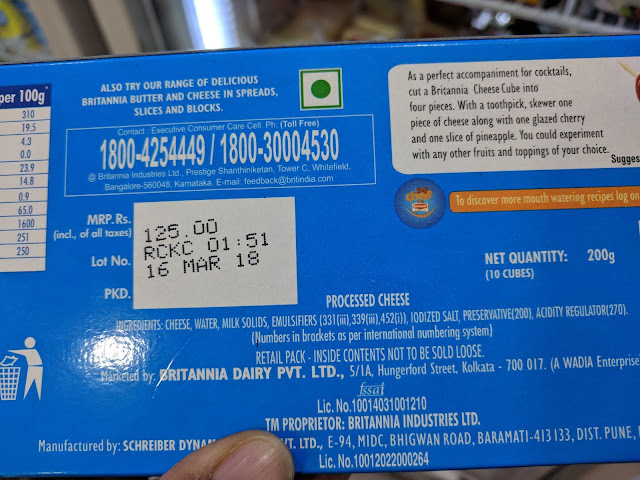 The shorter your life” - These cheese cubes stay good for 9 months from packaging when refrigerated. This is made possible ONLY through preservatives. As consumers, all we see is CHEESE but what about these ingredients with numbers? 339(iii) - Trisodium phosphate. Not permitted in EU, Australia and New Zealand. 452(i) - Sodium Polyphosphate. Not permitted in EU. Sodium comes not just from iodized salt but from these emulsifiers as well. Preservative(200) => Sorbic Acid. Linked to hyperactivity and asthma. The Food Intolerance Network in AU lists Sorbates (200-203) in their list of additives to avoid. Do we want our kids to consume such chemicals because the brand says “high calcium, goodness of cow’s milk”? Have we even checked if the packaged cheese has high calcium? 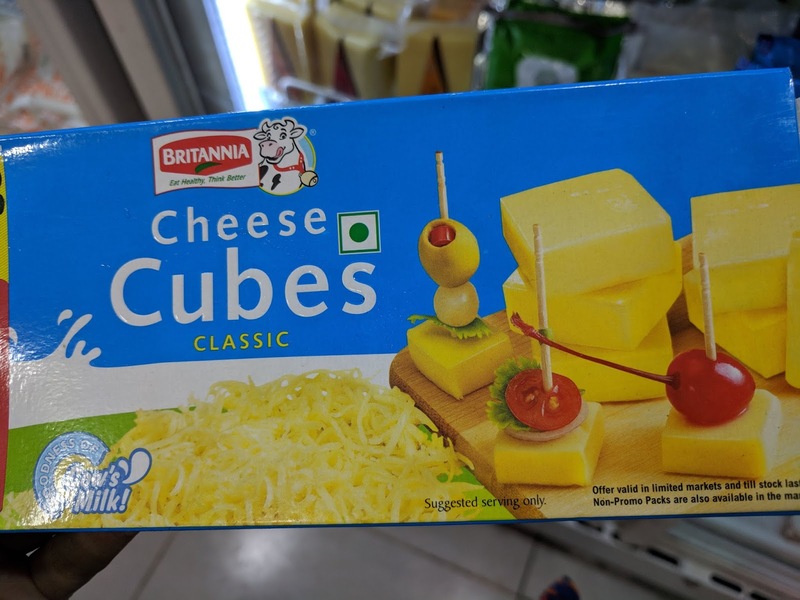 - a cheese cube of 20 gm serving size contains ONLY 50mg of calcium. Include 50 gm of ragi flour in your child’s diet in the form of idlis, dosas, rotis or pooris, which will give them 180mg of calcium. Include just 10 gm of sesame seeds in the form of chutneys, podis or mix it with paratha dough, which will give them 128mg of calcium. Check out more plant-based sources of calcium in my earlier blog post. Let’s also look at protein - a cheese cube of 20 gm serving size contains 3.9g of protein. A meal combination of rice/wheat/millets + one of the many lentils can easily give our kids around 6-7g of protein. Just sticking to basics and feeding them fresh, home-cooked meals is sufficient to meet their protein requirements. We don’t need such "high-salt, preservative-loaded cheese" in their diet on a DAILY basis.